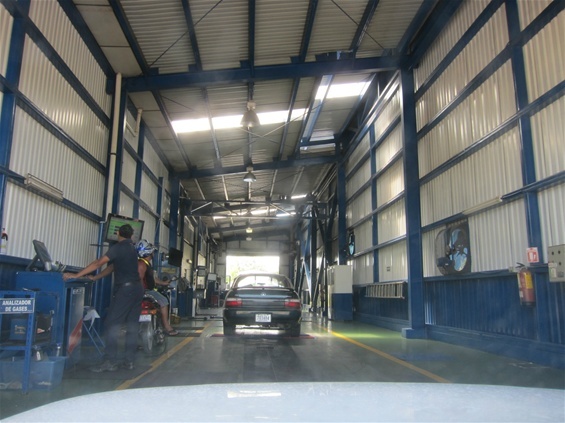 Monday was our appointment with the Costa Rica Government to have our car inspected for the RTV. I still don't know what RTV means, but it must be important because you have to have one. Most expats seem to hire someone to take their car in, but we did not have anything else to do Monday morning at 10am, had 10,000 colones burning a hole in our pocket for the inspection fee, and wanted an adventure. We drove about 70km's to Nicoya to the testing center. The official address was "On the main road about 500 meters before the Coke factory." "Be there 15 minutes early". Now that was not entirely accurate. It must have been before the Coke factory because we passed the Coke factory and did not see it after. Of course, we did not see it before either. After asking a guy with 2 oxen pulling a big wooden cart, we found out it was down another road, behind the big dirt piles, just before the Coke factory, but not on the main road. It looked like a modern DMV, very official, with officials sitting behind thick glass windows, and flags on flag poles. The sign in front of us had little pictures that indicated no guns, no cellphones, no hats as opposed to the more common U.S. sign of no shirt, no shoes, no service. We had all our papers, paid $18 and were told to drive to the tunnel and follow the instructions. So in we drive - first they checked all the doors, windows, seat belts, locks, and wipers. Then we drove forward and they shook and spun the front tires then the back tires. I still can't figure out what they tested. After that they checked the headlights by having us beam them into another weird machine. Next it was off to the giant tire roller. This time I had to stop the tires by putting on the brake, and it displayed all kinds of info on a big monitor. Finally we drove over a big pit and a guy inspected more stuff. We finished with a smog test. We passed and off to Playa Samara we went where I had an ice cold Pepsi - we had already passed the Coke factory after all! In TX they do a big test on your car every year too. Kind of the same thing, but not quite as big of a deal.